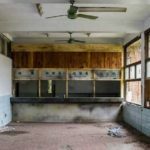 Where and what is Agdam ghost town? Officially, Agdam is a deserted city in Southern Azerbaijan but the answer is not as quite as simple as that. It is also a deserted city in Nagorno-Karabakh (NKR), a small republic in the Caucasus nestled between Armenia and Azerbaijan. The problem is however, that Nagorno-Karabakh is a self-declared republic that is recognised by no one (*). It therefore does not officially exist. It can be tricky finding maps that show NKR’s border. As an example, Google maps were accused provocation against Azerbaijan and now clearly show the Republic as Azeri territory! (*) This is not technically correct. Nagorno-Karabakh is not recognised by any other country or state but it is recognised by Abkhazia and South Ossetia (both also situated in the Caucasus) as well as Transnistria (which is located between Moldova and Ukraine), all three of which have rather dubious status on the world stage. Interestingly, Armenia doesn’t recognise NKR as an independent state, but continues to support it. So whilst there are question marks over the political status of Nagorno-Karabakh, expanding on the history of Agdam and what happened there is a little more clear-cut. Until the early 1990s, Agdam was a thriving city with a large population of reportedly up to 150,000 people. Of this population, practically all were Muslim Azerbaijanis (also known as Azeris). This is key because the majority population in the region at the time was (and still is) Christian Armenians. Photograph reproduced with the kind permission of Dirk-jan Visser who has authored a photo-book documenting FK Qarabağ Ağdam, an Azerbaijani football club currently based in Baku, yet longing to return to its home ground in Ağdam. Agdam’s status changed dramatically during the Nagorno-Karabakh War (1988 – 1994), an ethnic conflict between Armenia and Azerbaijan, both of whom held claim to territorial ownership of the region. 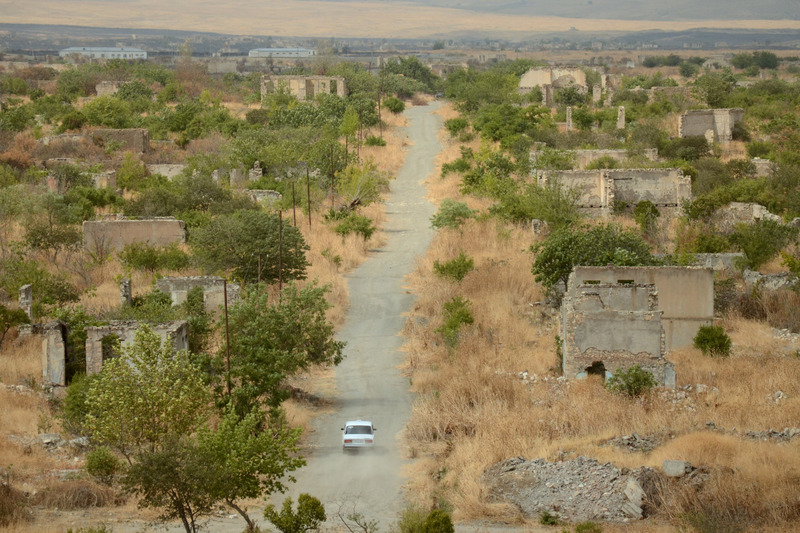 Agdam was often the scene of fierce fighting and in 1993, the city was captured, looted and destroyed by Armenian-backed Nagorno-Karabakh forces. As with the conflict in the former Yugoslavia, there were numerous violations of the code of war and eventually, the entire population of Azeris was forced to flee eastwards to Azerbaijan. 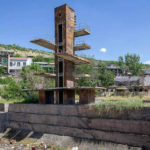 A decision by the Armenian military to raze Agdam to the ground (to prevent its recapture by Azerbaijan), left the city in an empty and ruined state. 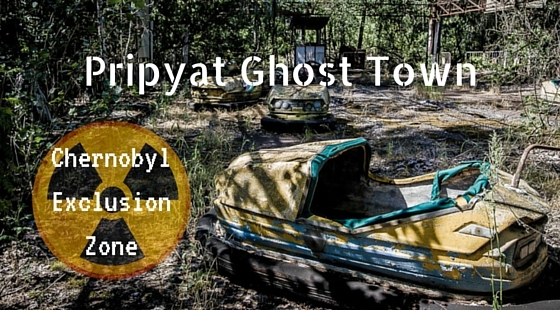 Subsequent looting and border skirmishes have ensured that the city remains in this state of desolation to this day, earning it the nickname; The Hiroshima of the Caucasus. Kirsty and I hadn’t really planned to visit Agdam during our time in Nagorno-Karabakh. We were travelling around the republic on public transport which is limited in availability and destinations. There are no marshrutka (shared minivans that run set routes) travelling to the centre of Agdam and it is difficult (although not impossible) to arrange for a taxi to take you to all the places of interest within the city unless you can speak Armenian and explain what it is that you want to see. Furthermore, when you get your Nagorno-Karabakh visa (which you can do at the Ministry of Foreign Affairs in Stepanakert after your arrival in the Republic), you have to list all the places you intend to visit. These are subsequently approved by the nice man at the Ministry and then detailed on a permit that you need to keep with you at all times. Agdam is still currently used as a buffer zone by the Armed Forces of Armenia, a Front Line if you will, and you have no chance of getting the city listed on your permit. This is partly for your own safety. There is still plenty of unexploded ordnance lying around plus both sides still take potshots at each other every now and then and a tourist being caught in the crossfire is not good for business. On top of this, what happened at Agdam during the war is still very contentious with such phrases as ethnic cleansing and genocide being banded around and this is another reason the authorities do not want you visiting. These two factors combined (no wheels and no permit), meant we hadn’t really considered visiting Agdam but good travelling wouldn’t be good travelling without the unexpected and a stroke of good fortune. Kirsty and I were in Vank, a village to the north of Stepanakert to see the impressive Gandzasar Monastery and stay at the surreal Eclectica Hotel (the building resembles the Titanic!) and on our day of departure, over breakfast, we met two lads from Germany, Alex and Sebastian, who had their own car. They had driven from Switzerland to the Caucasus and Nagorno-Karabakh was more or less their last stop before beginning the long drive back. Kirsty and I were intending to hitch back to Stepanakert that morning and then take a marshrutka to Shushi. The guys were heading up to Gandzasar Monastery before returning to Stepanakert and promised to give us a lift if we were still standing on the side of the road upon their return from the monastery. There was very little traffic that day but in this instance that was lucky for us as Alex and Sebastian duly stopped, kindly rearranged their very full back seat, squeezed us in and drove us back to Stepanakert. We all instantly hit it off and they said that their intention was to try and get to Agdam that day and would we like to join them. The answer from us was, of course, a yes and so after a quick pit stop in Stepanakert at a petrol station, we were on our way. Agdam is on the road to the archaeological remains of Tigranakert, which you are allowed to visit and was listed on all of our permits. As mentioned earlier, Agdam is still patrolled by the Armenian Armed Forces and the chance of getting stopped by them is high. The turning for Agdam is about three-quarters of the way along the road to Tigranakert and our plan, should we get stopped, was to say that we were lost, looking for Tigranakert and could they kindly point us in the right direction, preferably using a finger, not a rifle, as a pointer! What is there to see in Agdam? As you can see from the photographs, Agdam is a desolate place and there are no real sights as such. Driving through streets and surreptitiously photographing the ruined buildings is pretty much all you can do. If there is something to aim for sight-wise, it is the mosque which strangely enough is one of the few buildings in the city that has not been completely destroyed. If you can make it to the mosque undetected then it is possible to climb via a series of very narrow steps to the top of one of the minarets. The view from here is very different from the one on the ground and the scale of the destruction is even more apparent. Narrow steps aside, climbing the minaret is risky business as nearby there is a small army base and as soon as you lift your head above the level of the wall, you run the risk of being spotted. A sneakily snapped photo from the minarets of the mosque in Adgam. Thanks to Sebastian for allowing us to use his image. More of his photographs of NKR can be found on Tumblr here. Much of our visit (we spent about 1 hour driving around the centre and climbing the minaret plus another 20 minutes in each direction getting there and away from the highway) was preoccupied with trying not to get caught. We were constantly on the lookout for soldiers and darting down one side road followed by another. That’s not to say that the whole experience was not enjoyable (*). Visiting Agdam is Dark Tourism par excellence and the whole cat and mouse thing with the military ensured our adrenaline was pumping all the time we were there. There’s no denying, it makes for a great traveller’s story and you never know, in twenty years’ time I may write about it again, adding nostalgia as I did when I wrote about my first visit to Cambodia back in 1992. (*) Possibly not the right word, but interesting, fascinating etc go without saying and all things considered, the visit was fascinating. What happens if the authorities catch you in Agdam? I cannot answer this as we weren’t stopped and the truth is, we saw only two military vehicles during the whole time we were there. From what I can gather, what happens to you depends on who catches you. We met a French/Irish couple in Shushi who got caught. Fortunately for them, the head of the unit that approached them spoke excellent French and they managed to charm their way out without incident. You hear stories of other travellers being escorted back to the Stepanakert-Tigranakert Highway and told to be on their way. When trying to enter Agdam, some people don’t even make it past the checkpoint at the turn-off for the town, which was unguarded when we drove past and must be unguarded on a regular basis otherwise how does anyone get in? I have read reports of soldiers getting aggressive with visitors and of other reports of the military spotting you but just letting you get on with your visit. We think we fell into the latter category. As mentioned previously, we didn’t see a lot of army action. We heard the first vehicle approaching and simply drove down a side road and round a corner until they had passed. But we think the second military unit saw us and either mistook us for locals (unbelievably there is still some life in Agdam) or they had better things to do and couldn’t be bothered to deal with a bunch of foreigners. Either way we were lucky, especially when we decided to leave because the checkpoint that was unguarded upon our arrival was now a flurry of activity. We got a few stares as we went past but we kept our heads down, kept driving and nothing happened. What else can I tell you about Agdam? If you don’t manage to visit Agdam and you have your own transport, it is still worth continuing along the main highway to Tigranakert, even though the archaeological site itself is not impressive. Along the route there are several hillocks from where you can get a panoramic view of Agdam, albeit from a distance. The destruction is clearly visible and as there are no issues with visiting Tigranakert itself, there is no risk of a run-in with the military. Furthermore, and I have this on authority from the French/Irish couple who did it, if you continue past the turning for Tigranakert and drive towards the Azerbaijani border you will see smaller towns and hamlets that were also destroyed during the war plus the remains of tanks and other weaponry used during the campaign. Apparently there are no checks along this section of the road but note that getting too close to the actual border is not advisable as it is officially a war zone. There are two museums in Stepanakert that are connected with the war; the Museum of the Fallen Soldiers and the Museum of the Missing Soldiers. Both are worth visiting although there is little signage in English. Both museums are mentioned in the latest Lonely Planet Georgia, Armenia and Azerbaijan guidebook. Finally, if you do visit Agdam, don’t stray from recognised paths. And if you do get stopped, I suggest you just play dumb and pretend you are lost! Thanks and yep, we were lucky to get there. As I mentioned in the post, it’s difficult to visit by public transport and having your own wheels (or meeting nice people who have their own) is a good way to go. For me personally, it was one of the highlights of the year so far. I love the idea of visiting firstly ‘countries’ that don’t officially exist, but you guys have taken it up a notch! Hi Chris, thanks for your comments and you are right, heading into a country that doesn’t officially exist is a strange one. It’s the first time we have done so but we’ll keep an eye out for more in the future! Just spotted this in Wikivoyage. Bugger. Officially, tourists are prohibited from entering Agdam without permission due to its close proximity to Azerbaijan border; In the past, this rule was totally unenforced in practice, and travellers who encounter soldiers stationed in the region were not be turned back. As of 2018, there is a police checkpoint in Agdam where tourists are intercepted and kindly turned back. The guards also ask to delete any photos taken around Agdam, so it’s best to have a backup ready when approaching the checkpoint. Bugger indeed! Thanks for pointing this out. We will update the post. I guess it was only a matter of time given the sensitivity of the region. 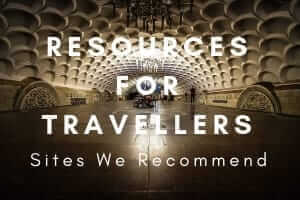 As you can see from the title of our post, we had a reasonable amount of difficulty visiting the place when we went there just over three years ago.